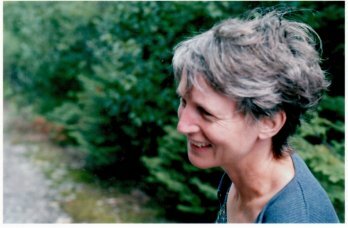 Ann Rothfels is an English storyteller living in the depths of Quebec, in the Eastern Townships. She gathers around her friends from both cultures and spends one evening a month animating The Townships Tellers, a group of community-minded tellers who share their love of story with the wider public. Ann has been telling stories since 1990 in every conceivable venue, including sitting on a hay bale at an outdoor festival. She has done house concerts, has told in numerous festivals and at some of the national conferences and her stories have been aired on the CBC. Her most recent production has been “The Winding River” a one-hour set about a 13-day canoe trip, where she is accompanied by a cellist. She is currently working on a set about being the mother of twins. Whenever possible, Ann incorporates music into her performances, for she has a love of singing and finds that story and song complement each other and provide a restful contrast for the listener.